Hello! It seems I’ve been avoiding the baked goods for a stretch of time here. Please understand. It’s swimsuit season after all, and all the hard work I have done with p90x is going out the window! I can’t seem to stop eating treats. Even though I send them to my husband’s work, I keep making more! Now, I have my husband’s coworkers sending me recipes, cookbook files and links of food they like, or think I would like. Yeah, that’s bad. But good (if you are a co-worker of hubby please keep sending me ideas)! But it’s bad. Because one of those ideas was to make Butterfingers. I was so determined to make these, that even though I opened my kitchen drawer and found my candy thermometer shattered, I forged on. Afterall, we’re talking butterfingers. The same candy bar I used to trade all other candy for on Halloween. Yeah, yum. These are delicious. Given that I did not use a candy thermometer they still turned out perfect. Hubby thinks I should use less peanut butter next time, but I don’t always listen to him. Especially when he talks about food. I mean, c’mon, the guy hates mushrooms but loves peanut butter and garlic sandwiches. He’s mine ladies, back off! Here’s what it comes down to though. These are really good, I ate five of them. Okay 6. Now, I must go exercise for the second time today (I had BBQ ribs too, which put me over the top), and I’m positive that while walking I will think about food. And what to bake tomorrow. Cause that’s what I do. Don’t judge. In saucepan, heat water, corn syrup and sugar until boiling. Boil for 10-12 minutes, keeping it at a continuous boil and stirring constantly. Remove from heat and quickly stir in warmed peanut butter. I pour these into my silicone brownie pan that has individual bites (24). But you could also pour them into a foil lined, and buttered, 8inch pan. Work quickly as it begins to harden. Press lightly into pan or brownie pan. Allow to set in refrigerator for 2 hours or overnight. When firm, melt chocolate candy coating according to package directions. 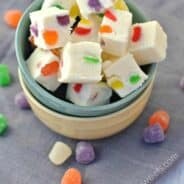 I use chocolate candiquik, but you could also use Wilton's candy melts. Dip butter-finger in melted chocolate using a fork. Set on wax paper. Enjoy. Lauren- if I open a bakery then it becomes work 🙂 Thanks for stopping by! 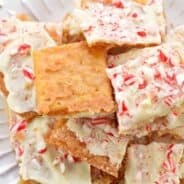 Saw this on This Chick Cooks link party and Butterfingers are my absolute most favoritest so you just got yourself a new follower. Oh my goodness! These look AMAZING! We found your blog through a link party and are your newest followers! We would love to have you follow us back! I am right there with ya!!! I just keeping baking more treats even though I have been trying to lose those unwanted pounds. I am right there with you on p90x…woo hoo I made it to week 4. One of these days I am going to see results…right??? These looks super fab!!!! What? Did you say peanut butter and chocolate? Oh yeah, It’s my favorite! Can’t wait to try. thanks! Girl, you have the best desserts!!! I love butterfingers so much, and have never heard of making them homemade before! I have to try these out! Oh I can not wait to make these! My hubby is going to think he is in heaven! Hi, Aimee! Enjoyed your blog/writing very much on this “blog hop” from basilmomma’s. (I hear ya on trading for Butterfingers)… 🙂 They look GREAT, as do all of your recipes! Thanks for stopping by my blog and adding your camping recipe. I love how versatile cresent rolls are! Your post made me laugh. I did the insanity program and didn’t see any great results because I couldn’t stay away from the sweets. Those peanut butter finger bites would be downright dangerous for me! I love love love butterfingers haha we have p90x too but haven’t tried it as we were tired after watching the 1st disk lol. I will make these & then perhaps start a diet. One last hoorah right? Thanks stopping by from Sweet Peas & Bumblebees. Love, love, love these. These are definitely going in my I-must-make-these-soon-and-eat-them-all-myself file. Thanks for stopping by and linking up to Creative Juice! These look amazing, yet very few ingredients. I can’t wait to try them. I send treats to my son every couple weeks. He will love these! Thanks!! I’ve made something really similar and they were such a hit! I had people begging for the recipe! And I also ate way too many of them myself! Oh man, I bet these babies are addicting! Oh my goodness! Those homemade butterfingers have me drooling. It is funny that all your husband’s coworkers keep sending you recipes. That could be dangerous 🙂 Thanks for coming over to share your recipe at These Chicks Cooked Recipe spotlight. Have a wonderful weekend! Yum Yum! What great little treats, these look so delicious. Thank you so much for sharing with Full Plate Thursday, have a great week end and come back soon! Ooh, I’m a sucker for anything peanut buttery or chocolaty. These sound heavenly! These sound absolutely heavenly! YUM! This looks SINFULLY good! Thanks for showing off! Oh, these look delicious! I love to make candy during the holidays for teachers’ gifts. I’ll definitely keep this recipe in my file. I’d like to invite you to share your recipe on A Well-Seasoned Life’s Sweet Indulgences Sunday. Saw these on Sweets for a Saturday – wow, they look so professionally made! I’ve done P90X too so I sympathize that you wouldn’t want to undo all that hard work :). Oh MAN!!! These look SOOOOO good!! I am the same way about Butterfingers – will definitely be making these! Thank you for sharing!! Hi, I am stopping by from the Sweets for a Saturday blog hop. I love butterfingers. These sound and look great. Yuuuummy! Butterfingers are my hubby’s favorite, so I think these are going on my list of items to bake. 🙂 I totally feel you about the whole sweets ruining hard work thing. I’m in the same boat as you! And you had me cracking up about not listening to your husband’s opinions all the time when it comes to food. I second that… hehe. Oh yummmy!! These looks so good, thanks for sharing!! I am staring in absolute longing at your delicious chocolaty treats. Oh how you tempt me . 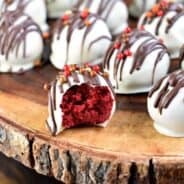 . . You made the Top 5 for last week’s Sweets for a Saturday! Oh yum! I woul not be able to put these down! They look amazing! Yet another thing I miss most from the U.S……Butterfinger or any chocolate/peanut butter marvel…..Could I possibly use Lindt chocolate or a dark chocolate instead of Wilton candy melts?…Really difficult to locate here…unfortunately…but I can use Lyle’s Golden Syrup for the corn syrup I believe!….Thanks for your generous sharing of your profound culinary acumen!! OOPS! !…Just another question….What did you use for the garnish/sprinkle on top of these luscious-looking wonders….chopped peanuts or a cookie crumble? I’ll bet crushed speculoos (Biscoff)cookie crumbles would be awesome…or a praline or toffee riff….or even putting Biscoff crumbles into the peanut butter mixture for “crunch factor”? !…Obviously need to get outside and on with my life today!…Chortle. Whoops, forgot to include that. I took a piece of the homemade butterfinger before dipping it and crumbled it. I then sprinkled it on top! ENJOY.